Wendy Rose has posed a question. She says that Thomas Causton, Gent and Martyr on the Rayleigh Memorial actually lived in Thundersley, but does anyone know just where he lived? Would it have been the Manor as he had property elsewhere. Wikipedia, which is not always reliable, says that Thomas was a Protestant “gentleman” who was burnt at the stake in Rayleigh under Mary I on 26th March 1555 and lived at Horndon-on-the-Hill or “Thundersby”. The website www.findagrave.com says that Thomas lived in Thundersley with his friend Thomas Higbed who was arrested with him, so that may give a clue. (Higbed is commemorated with a plaque at the Bell at Horndon, where he was burnt at the stake). The Echo reported that The Martyrs’ Memorial, in Rayleigh High Street, (the building of which was organised and paid for by 3 devout Protestants from the town, who raised the £85 needed for its construction) was unveiled in front of 2,000 townsfolk on September 23, 1908. Two of the four men commemorated were said to have been burned to death in the High Street on the very spot of the memorial, while the other pair were killed in Smithfield Market, London. The Essex Family History website at http://www.essex-family-history.co.uk/caulston.htm says that he had land at Thundersley which was his main family residence, but offers no further detail of any location. 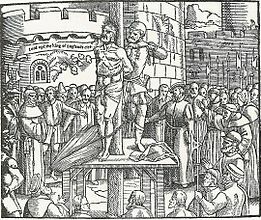 It goes on to say that he was denounced as a practicing protestant, arrested with his servant and taken to be held in chains in Colchester Castle dungeons. Bishop Bonner went to Colchester, but was unable to get Thomas to turn back to Catholicism and so took him to London. He was sentenced to death at the stake and on 23 March delivered to the Sheriff of Essex and then burnt at the stake at Rayleigh. As a consequence, Robert Drake, the Thundersley Rector who had been sponsored by Causton was deprived of his living and Causton’s lands were confiscated. It is said that the Causton family tried unsuccessfully to recover the estates. So Wendy’s question remains. Can you say where Causton lived while in Thundersley?